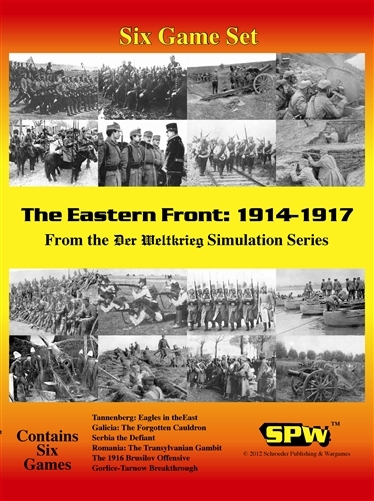 Six different games PLUS Rules to Link the Games PLUS East Front Campaign Game. The vast majority of the German Army is arrayed against France and Belgium. Only a small force is left to hold off the Russian hordes in the east. German plans are to conduct a fighting withdraw from East Prussia. The Russian invasion causes the German commander to panic. Hindenburg replaces him, and bold plans are formed. The Germans take desperate gambles as they counterattack against two separate Russian Armies. Russian infighting and ineptitude lead to one of the greatest victories in German military history. The main bodies of the Austro-Hungarian and Russian Armies face each other across the fields of southern Poland. Each side moves to attack and drive the other back. The Austro-Hungarian vacillation between different war plans creates confusion, but the fighting spirit of their professional Army produces initial success. Additional Russian armies join the fray and attack the weak Austrian right flank. A see-saw fight ensues, ending with an Austro-Hungarian retreat to the mountain passes protecting their heartland. Both sides now steel themselves for a protracted struggle that could mean the end of either Empire. Austria-Hungary invades Serbia as punishment for her role in the assasination of Archduke Ferdinand at Sarajevo. Since most of the Austrian Army must confront the Russians, the forces facing each other in Serbia are rather evenly matched. The Serbian Army, battle hardened by years of fighting in the Balkans, aggressively counters Austrian incursions. The Serbs fight for their national existence in one of the greatest "David vs Goliath" campaigns of modern history. With the front in France stalemated across no-man's land, the Germans redeploy powerful forces to the east. Their objective is to save Austria-Hungary from Russian pressure. Initial penetrations at the towns of Gorlice and Tarnow soon unravel the Russian defenses. A dramatic pursuit of the Russian Army across Poland ensues. The brilliant Russian general Brusilov develops tactics to crush the Austro-Hungarian front lines. His bold plans call for wide-front assaults that prevent the concentration of Austrian reserves against any single thrust. The Russians destroy an entire Austro-Hungarian army and create a crisis that the Austrians and their German allies will have extreme difficulty containing. The Russians have the opportunity to win the war on the Eastern Front. Russian successes bring the Austro-Hungarian Empire to the breaking point. The Romanians seize the moment to grab Transylvania from their once powerful northern neighbor. The Austrians have little left to hold off the Romanian invasion. An ad-hoc formation of Germans and Bulgarians counter-invade Romania from the south. Russia sends reinforcements to their new ally. Each side moves to seize and retain the initiative in an epic campaign. 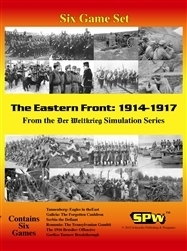 Eastern Front: 1914-1917 is a outstanding wargame and a great introduction to the Der Weltkrieg series. 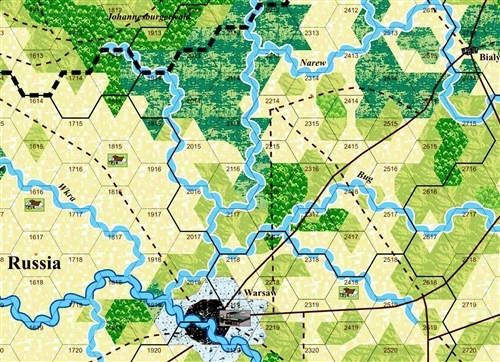 The included scenarios vary widely in size and number of units involved on each side, so you can get used to the system with one of the smaller scenarios (Serbia or Romania) and then go for the full effect with one of the larger scenarios (Galicia or the Brusilov Offensive), or really begin to appreciate the full scope of the game system by combining multiple scenarios together, culminating in the Duration Game, which combines all the scenarios and allows you to simulate the entirety of World War One on the Eastern Front at the divisional level. This is truly a monster game, but it is extremely approachable. The rule system is surprisingly easy to pick up for a game of this size, yet it simulates the reality of World War One conflict extremely well. I cannot recommend this game enough! If you have any interest in the First World War, this game is a must-have! 10 out of 10!